Introduces an Ebony Diamond Circlet to jewelry crafting. The gems are set up in a manner similar to Gemling Queen Jewelry's gems, so the screenshot doesn't do it justice. Examine it in the RaceMenu for maximum magpie. Available for all vanilla playable races. 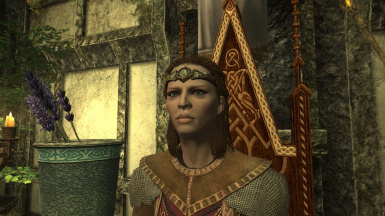 Additionally, the Mage's Circlet reward from Savos Aren in the College of Winterhold quest has been altered to be this circlet. To craft, you must have a minimum of 50 Smithing. Ingredients are 1 Ebony Ingot, 2 Diamonds, 1 Flawless Diamond, and 5 gold (for the gold trim bits). Unpack the ESP module and the Meshes folder into your Skyrim\Data folder. Activate the ESP module "EbonyCirclet.esp" using the mod manager of your choice. If you have Gemling Queen Jewelry, there may be some overwrite alerts. The assets are identical, you may overwrite without worry. Gave Elisif an ebony diamond circlet. Made the Diadem of The Savant an ebony diamond circlet. Buffed its enchantment to make it more worth finding. USKP dependency now, as USKP adds a tempering COBJ for it, and it needs to be an ebony ingot, not gold. It's also buffed by the Ebony Smithing perk now too. ...and use AddItem to add the outputted FormID that it gives you. Updated USKP dependency to USLEEP. 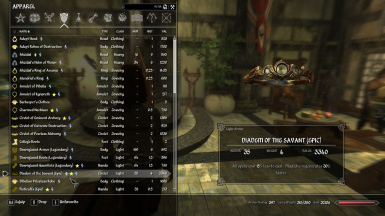 Special thanks to Saerileth for allowing usage of Gemling Queen Jewelry (http://www.nexusmods.com/skyrim/mods/52266/?) assets here, and for taking my True Circlet Gems a step further in Gemling Queen Jewelry.